We are proud to show you our wonderful city on a completely-custom, uniquely-Albuquerque, open-air trolley. There is no other city in the country (or probably the world) that has a trolley like this. 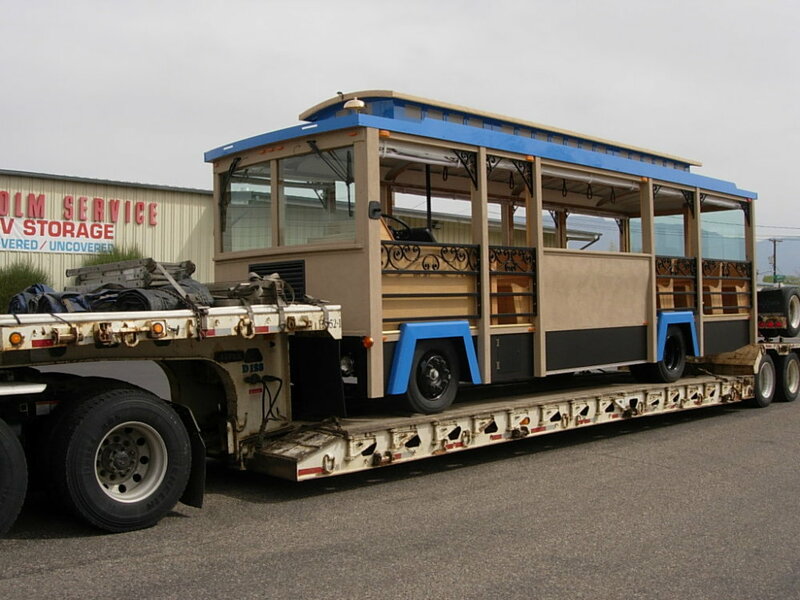 When we first started ABQ Trolley Co., we wanted to bring something to Albuquerque that would capture the essence of the City; we definitely did not want to use something ordinary like buses, shuttles or mini-coaches. Classic Trolley in Medford, Oregon, was chosen as the builder. Uniting with Classic Trolley, we designed a trolley that incorporates specific elements that are uniquely-Albuquerque. Click here for more photos of the Trolley. Also, check out our T-Day: The Trolley Has Landed! gallery for photos. Photo: The Trolley being delivered to Albuquerque on the back of a flat-bed truck, March 20, 2009. 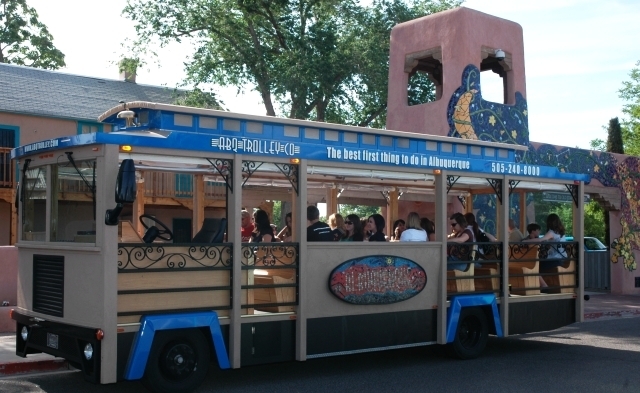 Throughout our website we refer to our completely-custom, uniquely-Albuquerque, open-air trolley. What exactly do we mean by "uniquely-Albuquerque?" There is no other trolley like this in the world partly because there is no other city in the world quite like Albuquerque. We designed our trolley to reflect the heritage, culture, and unique look of Albuquerque. For example, traditional trolleys found in other cities are accented in brass, employ a standard red, green, or orange paint scheme, and are fully-enclosed. Our "uniquely-Albuquerque" trolley, however, is accented in wrought iron and tin, has two custom art pieces on its exterior, a custom stucco-paint scheme accented with bright blue trim, and an open-air environment to allow for the total enjoyment of Albuquerque's famous 310 days of sunshine! Not only will you receive a comprehensive 18-mile, 90-minute, front-row seat tour of the Best of ABQ, but you will also get to enjoy it from a trolley unlike any other in the world - climb aboard! Our Trolley is open-air. There are no windows, walls, or enclosures; only a roof shades guests from the warm New Mexico sunshine (sunscreen is highly recommended). We do have drop-down rain curtains to shield our guests from the weather; however, a light jacket may be necessary in some months. Check the local forecast for Albuquerque here. We are excited to announce that the Trolley has arrived in Albuquerque! Photo: The completed Trolley after being installed with custom graphics and mosaic tile art pieces.